It should come as little surprise that I am not, a natural morning person. I have, on occasion in my life, been an unnatural morning person but given my rathers, I'd start at 10am and then with a short break for dinner and a shower, happily settle into work at 8pm and work through the night. Strange therefore, that breakfast should be one of my favourite meals. It is not something I eat often, I usually skip breakfast all together but once in awhile, I like to get up and cook breakfast. I think this has something to do with breakfast foods, like milk, honey, eggs, bacon and how they smell, drifting through the house, especially on a cold winter's day. I'm convinced also, that my soft spot for breakfast is because when I was little, once a week, my mom would make french toast or bacon and eggs for a family breakfast. 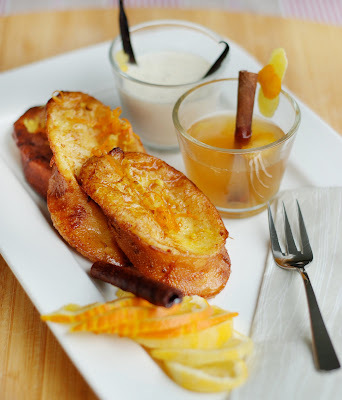 This is a really wicked recipe for Torrijas, contributed by my Spanish colleague. I'm told it is the Hispanic take on french toast and that soaking in egg or milk is inherant to their desserts, witness for example, the Tres Leches cake. I've tried it at home and I completely concur, the deep-fat frying in oil is completely off-putting but I couldn't stop myself from devouring a slice and then another, and then a third. The syrup pairs orange, cinnamon, honey and white wine in a brilliant and addictively sweet and sharp combination. 1. 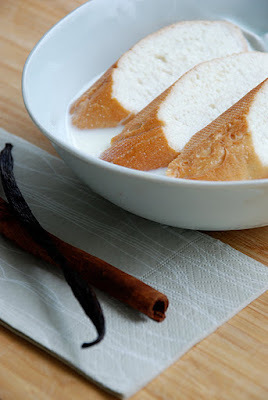 Boil the milk into a saucepan with the cinnamon stick. Set aside to cool. 2. Beat all the eggs in a deep dish. 3. Cut the bread into thick slices of about ½- inch, and soak them in the warm milk. Press the bread lightly between your palms to remove the excess liquid. To ensure that the bread does not absorb too much milk, 2 day old bread is preferred. Wide breads such as batard or bloomers are also recommended. 4. Remove from the milk and coat the bread in the beaten egg. 5. Heat the oil in a deep pan and deep fry the bread until golden brown. Drain the excess oil by placing them on paper towels. Arrange the toasts on a serving plate and garnish with additional orange rind, lemon rind and cinnamon sticks. 6. For the wine syrup, place all the ingredients in a saucepan and bring to a boil. Continue boiling to reduce the liquid so that it will be infused with the flavours. Repeat for the milk syrup. 7. Set aside the wine and milk syrups to cool. Remove the cinnamon sticks, orange and lemon rinds from the syrups and use to coat the bread. 8. We usually serve the toasts with either the wine or milk syrup. For those that do not have a very sweet tooth, a sprinkling of cinnamon sugar will be equally nice. * Cook's note, I used baguettes for this picture because I couldn't find another suitable bread on short notice. However, the look and texture of the final product does vary considerably based on the bread used, so if you want a more presentable product, it's better to use a stiffer bread. Before I start, I want to wish my dear friend C. all the best, as she sets out on a new life path, I hope you will know all the sweetness of dreams pursued. This post was possible only because of her patient and provisional help, in fact, I've found the secret to posting good step-by-step photos- have someone else execute the steps for you! This is her demonstration of the first step to glorious tea-time treats. This dough is Dorie Greenspan's Sweet Tart Dough, which she weighs out to 20 grams and then presses into individual, greased tart tins. These are then baked blind for 20 minutes, till just browned. They are then filled with frangipane and baked again, so don't overbake them the first time. The recipes for both are easily available online. This post, like all good things, was bourne out of greed. I never used to like Mont Blancs, in fact, I never used to like chestnut. I still don't really. I like little ones, Chinese ones, water chestnuts and those hot crackling ones you used to be able to buy on the streets of Beijing, roasted over a charcoal brazier, but big honking, glazed sweet and cold but starchy inside ones? Yuck, no way. For years, I thought of Mont Blancs as a sickly sweet yet starchy tart and trying some pretty poor versions did nothing to improve my opinion. It wasn't literally, until last year when I was in Angelina's, in Paris, with a couple of friends and our host, SW, urged me to try one and I thought, "well, why not". I don't know if it's because it was their specialty or because we were having a really great tourist shopping day, but it really worked its magic. It was light and fluffy, yet sweet and with just a light hint of chestnut sweetness against a dense base of tart and cream. I couldn't stop eating it and enboldened, I stopped on my way out and bought a large bottle of chestnut puree to tip into future macarons. Months later, of course, this hadn't quite worked out the way I'd expected and the jar was still sitting there, front and center in my pantry, mocking me. So when C. suggested Mont Blancs, I jumped at the chance. My contribution to this process (and I do mean almost my only contribution), was to suggest that instead of pastry cream inside the Mont Blanc, we could use chocolate mousse. I'd just stumbled upon the recipe from one of my favourite blogs, Canelle Et Vanille's mouth-watering Donna Hay-esque blog and had fixated on this fantastic picture of her tri-chocolate mousse. My goodness, I'd never seen white, milk and dark chocolate so prettily juxtaposed. Of course, it wasn't till I started the recipe that I realized, with a sinking horror, how much additional work is involved to elevate this mousse to a whipped lightness. This is the how the pate-a-bombe is made, you whip together a mix of glucose, egg yolk and sugar and water. I was slightly alarmed at the sticky, pastey texture of this and I think I may have shortchanged it a little water but it turned out alright in the end. I tried to follow her recipe exactly, chopping the chocolate and mixing in the pate-a-bombe vigourously into the melted chocolate. I then whipped thick cream and added to the chocolate. For those of you who are counting, that's three times that you have to wash your mixing bowl, for just the mousse alone. If I ever, ever willingly offer to make these, please know that despite my protestations to the contrary, I must be in love with you. I'm reminded of the Bruce Lee movie where his mean boss at a Chinese restaurant tells him that he will only ever be a "deeshwasher". That's what I think one needs to be an accomplished chef, a really, really good washer-up. I suppose good things come to those who work and wait. Stir, till it's all mixed. These are the most gorgeous moments of baking, when your chocolate swirls into the cream and all the world is a deliciously carefree mixing bowl. Eventually, when it starts to resemble chocolate again, refrigerate it for a few hours and this is what you come away with. The colour darkens substantially as it cools. These are the tarts bases after they've been baked and cooled. Scoop the chocolate mousse carefully and neatly onto each. I know, I should have used a small melon ball scoop. You can also use a piping bag, if you are using pastry cream, use this instead of the chocolate flavour. Having tasted both, I prefer the dark, rich base of the chocolate and I love the mix with the crumb of the tart and the chestnut. Some people though, prefer the pastry cream as it is lighter but I find it doesn't provide enough contrast to the chestnut. Pipe the chestnut streams around and over the ganache. This is the most fun part of the process! As you can see from the picture, Angelina lies, clearly- their bottled chestnut puree is actually not of the same texture that they use in their Mont Blancs, it is far too soft. This can be remedied by mixing the chestnut with buttercream (beware, it does curdle) and or perhaps by chilling the chestnut until it thickens slightly. I like the light taste and texture of the Angelina's chestnut puree so the next time, I think I will mix it with fresh chestnut puree. Now seeking some Paris-bound mules to bring some back for me. When they are done, top the Mont-Blancs with icing sugar and chocolate nibs or gold leaf. Be warned that they are painful little things to craft and very fast to eat. But, they were the first things that I've made in awhile that received raptrous approval from both Mom (aka particular discerning bad cop barometer) and brother (aka particular discerning good cop barometer) and I really thought they tasted fantastic, well-balanced, rich and sweet. Sometimes it seems like the Chinese food market here is dominated by just a few names, like Crystal Jade, Imperial Treasure or the Tung Lok Group. Search a little harder, however, and you will find that there are plenty of other Chinese restaurants, some with very illustrious histories, which still exist and continue to serve very fine food. Sometime last week, I went to just such a place: Spring Court was founded in 1929 and is still a family-run business that now operates out of Upper Cross Street. Although pretty unassuming from street level, the restaurant is actually huge, occupying a towering four floors, and on a Sunday night, the place was packed. I suspect this has something to do with the fact that Spring Court is currently celebrating its 82nd anniversary, so there are a number of promotions going on, making it extremely value for money. The promotion we enjoyed, for instance, lasts till the end of September, and allows you to order a Peking duck for only 82 cents if your bill comes up to $82 or more. It's hard to think of a better deal than that, if you ask me. What's really special about Spring Court, however, is the fact that you can still tell it's a family-run restaurant from some of the food it serves, because some of these dishes are like something out of someone's (very professional) kitchen. The scallop porridge, for instance, is a nice bowl of congee (a little thinner than I am used to) with plump, sweet scallops lurking within. With a sprinkling of freshly-cut chives, this is probably one of the healthier things I've eaten in a Chinese restaurant. Speaking of eating healthy, I really enjoy eating popiah, but it's not something I get to eat very often because it's so tedious to grate the ingredients and stew them into the sweet, juicy filling they have to become. Why don't I just buy popiah from food courts or hawker centers then? Well, for one thing, I'm quite particular about my popiah, and I find that most commercial sellers don't do a very good job, because the filling tends to be bland, mushy, and not very generous in terms of what you get. At Spring Court, however, I was happy to see that there was no such problem. The popiah rolls were enormous, and stuffed so full with ingredients that they were virtually bursting at the seams. In fact, they're so large that it's probably difficult for one person to finish one all by him or herself, so you can imagine how we had a slight problem with 8 rolls for 7 people. Although Upper Cross Street may be a little inconveniently located, it should be said that parking is a breeze as a result of two public car parks located across the road from the restaurant. Service is brisk and pleasant enough, so if you're getting a little tired of the same old Chinese cuisine, maybe it's time to try something more homely at Spring Court.